Boundaries! I think these might be the things my tribe most want to talk about when they first begin. There are a lot of myths and beliefs that cause a great deal of discomfort and stress when it comes to boundaries. I get it, but they shouldn’t. Boundaries are a beautiful thing! Well, they are when they are done right. Let’s get clear however, around what I mean when I say personal boundaries. I’m talking about the choices you make about what is good and okay for you, and not good or okay for you. These are choices you make in regards to the relationships you have with your family, spouse, work, clients, random strangers on the street and most importantly with yourself. They stem from your beliefs and values. They are most definitely choices you make. They are what you allow and what you tolerate. 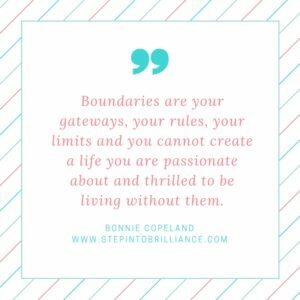 Boundaries are your gateways, your rules, your limits and you cannot create a life you are passionate about and thrilled to be living without them. Most of the stress comes when we worry around what others will think about our saying yes or no, or choosing different methods of connection or disconnection. After all, we don’t want to hurt or upset people right? But let’s think about that for a moment. That stress, that worry…that’s giving our power away and putting our happiness into the hands and reactions of another. Trust me, that won’t work. Having clear personal boundaries is not just about kicking people off our personal island ya know? When you have personal boundaries that are clear and gently, but firmly enforced, you create something beautiful with other people. You create honest communication, integrity and (most importantly) trust. To have a healthy relationship, both parties need to know and respect each others wants, needs, desires and goals. Guess what? Personal boundaries are a big part of that. What happens when someone doesn’t like them? We question our own sense of self. The truth is, if someone doesn’t respect or like your boundaries, they are really just telling you a whole lot more about who THEY are, than who you are. To put it bluntly lovely…that’s not your problem to fix. Listen, we all have times were we struggle with our boundaries. Those are the times to be gentle with yourself. Appreciate who you are. It’s pretty awesome. Respect it by standing firm within your boundaries and know you are doing it with loving intent. Let me know in the comments where you struggle with personal boundaries and how you handle it. Are you in the “it’s all crappy club”?